Looking for a local eatery that uses authentic #lard in their refried beans to make one excellent burrito? 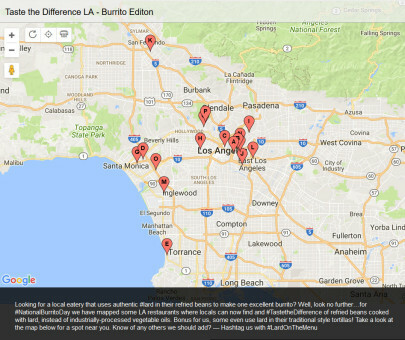 Well, look no further…for #NationalBurritoDay we have mapped some LA restaurants where locals can now find and #TastetheDifference of refried beans cooked with lard, instead of industrially-processed vegetable oils. Bonus for us, some even use lard in their traditional style tortillas! Take a look at the map here for a spot near you: https://batchgeo.com/map/343baa7ff37598f98b6a643cfc75f462.